It's been a great trip so far! Do You Know an Outstanding Mentor? Do You Know an Outstanding Illinois Pharmacist? It’s an Award for the Brightest of Our Rising Stars! KeePosted is an official publication of, and is copyrighted by, the Illinois Council of Health-System Pharmacists (ICHP). KeePosted is published 10 times a year. ICHP members received KeePosted as a member benefit. All articles published herein represent the opinions of the authors and do not reflect the policy of the ICHP or the authors’ institutions unless specified. Advertising inquiries can be directed to ICHP office at the address listed above. Image disclaimer: The image used in the Pharmacy Tech Topics advertisement is the property of © 2014 Thinkstock, a division of Getty Images. Copyright © 2014, Illinois Council of Health-System Pharmacists. All rights reserved. 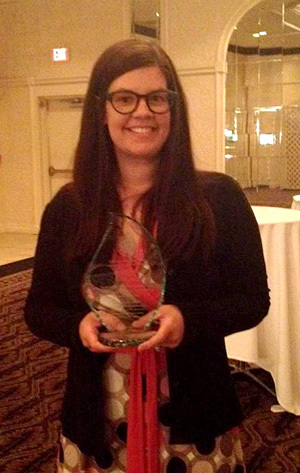 Last year, ICHP created the Amy Lodolce Mentorship award as a memorial to Amy Lodolce, a University of Illinois at Chicago College of Pharmacy faculty member who touched the lives of pharmacy students, residents, and colleagues through her passion for teaching and the profession of pharmacy. Throughout her time at the college, Amy oversaw the training of four PGY2 drug information pharmacy residents, all of whom are currently drug information faculty at various institutions. She worked directly with numerous PGY1 residents and APPE students during their drug information rotations. She also served as a formal mentor to her student advisees, and was the advisor of the Phi Delta Chi pharmacy fraternity for many years. As the Assistant Director of the Drug Information Group, Amy served as an informal mentor to other faculty and was quick to help new faculty become oriented and situated. Amy approached being a leader and a mentor with an “open door” policy and would selflessly pause her work to address others’ needs. Students, residents, and faculty were impacted by her dedication as she worked tirelessly to provide them with quality learning opportunities. On August 31st, 2012, Amy passed away at the young age of 38 after a long illness, and this award was created in her memory. Amy’s dedication and generosity to the profession of pharmacy have positively shaped many pharmacists’ careers, and the memory of her will continue to do so. Nominations may be received through June 30th of each year and should be sent to the ICHP office. In the event that there are no suitable nominees for the award, an award will not be presented. ICHP is looking for the best of the best for the 2014 Pharmacist of the Year Award Recipient! You should recognize some of the previous years’ winners as they have been pharmacy leaders in Illinois and nationally: Stan Kent, Kevin Colgan, Andy Donnelly, Miriam Mobley-Smith, Mary Lee and so many more! One of the earliest recipients of Illinois Health-System Pharmacy’s highest award, Herb Carlin, served as President of both ASHP and APhA – a feat that has been done by only a very select few! The ICHP Pharmacist of the Year recognizes a pharmacist who has worked in or around health-system pharmacy making substantial and sustained contributions to health-system practice or the profession in general. Below are the criteria for selection. Nominators should send a letter outlining the nominee’s accomplishments in detail to Ann Jankiewicz (2014 Selection Committee Chair) at Ann_M_Jankiewicz@rush.edu or Scott Meyers at scottm@ichpnet.org. Possess a strong commitment to the advancement of the pharmacy profession. * Membership in ICHP and volunteer activity within ICHP’s divisions, committees or board of directors are absolute requirements to receive this award. To apply or nominate someone for this award, please forward a detailed letter of recommendation identifying the specific accomplishments of the nominee with respect to each criteria above to ICHP, 4055 N Perryville Road, Loves Park, IL 61111-8653, or email to scottm@ichpnet.org. Nominations for 2014 are due Thursday, July 3, 2014. Selection of a recipient shall be by the ICHP Board of Directors by secret ballot. The nominator may be requested to provide additional information to the ICHP Board of Directors to facilitate discussion and selection. Help us recognize one of tomorrow’s leaders and an outstanding new practitioner of today! You may be asked to electronically submit your manuscript to the ICHP KeePosted for publishing. I had the opportunity to attend an awards ceremony a few years back and found myself seated with a hospital administrator and several leaders from other healthcare fields during dinner. Usually when one is seated with five people you have never met, of course the other five end up being colleagues of some sort, known each other for years, and you get to be the odd man out during this happy reunion. As it turned out, the hospital administrator was a contemporary of mine, had graduated from pharmacy school at about the same time, and we ended up being a part of an interesting discussion. What a relief! The administrator had not practiced pharmacy for decades and pointed out during our discussion that most likely he had forgotten almost everything taught in pharmacy school. He was a bit embarrassed by this. I remarked that perhaps having forgotten college material might not be as big a problem for him as he thought as most of the things we learned have been updated, and a lot of material we had learned is now flat out incorrect! Of course I was being a wise guy during dinner conversation, but I think anyone who has been out of school for a dozen years or more has noticed that so much of the latest information tends to contradict earlier information we spent so much energy learning…which brings me to the question: Is your practice evidence-based? I think our goal as clinicians is to base our recommendations on findings that are reported in adequately powered randomized, double blinded studies using an active comparator that reported meaningful improvements in clinical outcomes in intact human beings. (Such studies are usually classified as Level 1 evidence.) We all agree with this statement of course, but sometimes the perfect study doesn’t exist (yet), and we need to make decisions about treatments that are based on weaker information. There is nothing wrong with using placebo comparisons or observational studies, or basing recommendations on expert opinion, anecdotes, or even on laboratory results…as long as a) it is the best information available; and b) the increased level of uncertainty is described and is transparent. My point is that information from Level 1 evidence has a lesser degree of uncertainty and tends to hold true over time, and while we may need to modify our views a bit in the future, the basic structure of our understanding often does not change. On the other hand, information based on animal models, human cell cultures, laboratory analyses, observational studies and even expert opinions may often be corrected and substantially revised when later examined in a Level 1 type study. Most of us provide a necessary caveat to our audience most of the time. I would like to see us as pharmacists become more consistent at reporting the limitations of our recommendations. Whether the audience is our students, residents, or colleagues and whether the venue is KeePosted, the ICHP Annual Meeting, or the Spring or Regional Meetings, we should be careful to specifically point out whenever information is based on less than Level 1 evidence. By pointing out the limitations and inherent uncertainty of your analysis, you will let your audience know there is a good chance that someday in the near future your conclusion will need to be revised. And of course when instead recommendations are based on Level 1 evidence, it’s a good idea to plan on remembering this data into the future! Please let me know your opinion on this topic. I plan to submit this recommendation to the Division of Educational Affairs for consideration. It’s been a great trip so far! An email in jest from a good friend took me down a rabbit hole and got me thinking about what my life would have been without ICHP. It’s been 22 years in May, since I became ICHP’s first Executive Director and now Executive Vice President. Twenty-two years is no special milestone to celebrate but whenever May 10th rolls around, I tend to reflect a little. And because I’ve been writing ten “Directly Speaking” columns a year for now 22 years, sometimes I get a little blocked for a topic. So my reflections have helped break this month’s block for me and you! Rather than talk about all the specifics of my 22 years (because I really want you all to continue reading this column after this issue), I’ll see if I can use the space to demonstrate how ICHP can support, alter or impact your lives. And I certainly don’t intend to encourage you all to prepare to take over my job in the future, although I would say that any pharmacist who has an interest in this type of position should consider what it might take to prepare for something like this. I’m guessing there might be one or two of you out there. ICHP gives any member who seeks it, the opportunity to learn at a variety of levels. Of course there’s always been continuing pharmacy education (CPE). In 1977 when I first joined ICHP, the most available CPE opportunities were the pharmaceutical industry sponsored educational events. Most included a dinner at a nice restaurant, and I fondly think of those days as the “Supper Club Days”. Those have been gone now for many years and while I think everyone from my generation misses those wonderful meals, any of us that are truly honest also will say that the education was suspect if not completely biased in many cases. Today, ICHP offers the Champion Webinars every other month. These live and online programs provide 30 minutes of CPE credit on the hot topics of the day, presented by experts in the field, and you don’t even have to leave work! Granted, there are no meals but with a sack lunch or snack of your choice, you can always pretend you’re enjoying fine dining while you do obtain great CPE credit! But these Champion Webinars, the “Supper Club Meetings” of today, offer you another opportunity. Once the program ends, you can discuss with colleagues what you believe the value or impact of the program might have at your institution. It’s a chance to get to know the practice side of your colleagues a little better and hopefully improve care for your patients. In 1977, I didn’t get involved with ICHP’s statewide meeting, the Annual Meeting, but after a few years, I became an officer of the Rock Valley Society of Hospital Pharmacists and found myself attending the Annual Meeting as a Rock Valley delegate to the House. That single step of becoming an affiliate officer and a delegate to ICHP’s House opened two doors. The networking I had come to enjoy at the local CPE programs expanded immediately when I travelled to the statewide meeting. I met pharmacists (sorry technicians and students rarely attended our meetings back then) from all over the State. I remember sitting at a back table at my first Annual Meeting banquet in 1982. That luncheon featured William E. Smith, the 1982 Whitney Award Recipient, and as I sat and ate my meal, listening to Bill present, I thought to myself, “Someday I want to know the people at the head table!” Little did I know that eventually, I would be the one that decides who gets to sit at the head table, or even if there is a head table! Long story short, I know, “too late”, the mere fact that I was able to venture forth from Rockford to attend that meeting in Rosemont, opened up another level of networking and friendships that I never really thought I would have. Perhaps society has progressed enough these days with technology that individuals can network without leaving home, but I still find that the face-to-face opportunities create stronger relationships that often lead to friendships and a willingness to share whenever and wherever help is needed to improve practice. In 1985, Illinois sought to join most other States in requiring CE for pharmacists’ relicensure. Being an altruist (at the time) and knowing what kind of CPE programming was currently available, I convinced the Rock Valley Society to take a position opposing mandatory continuing education for pharmacist relicensure. Our delegation took that position to the ICHP House of Delegates, and with the oratory help of Past President Harland Lee, the House narrowly approved a position opposing mandatory CE. This was a great accomplishment; however, ICHP did not have a lobbyist in Springfield, and there was already a bill rolling through the General Assembly. A few weeks later, as a member of the ICHP Board of Directors, I personally took the fight to Springfield with an on the road before dawn drive, not knowing what to do or with whom to speak. IPhA fully supported the bill, and their lobbyist was absolutely no help. Eventually, I found the clerk of the Senate Professional Regulations Committee, completed a witness slip and waited to testify before the committee. The bill was called, and the witness slips were read, without calling a single witness, the bill was passed out of Committee and my day seemed to be a waste. I signaled the clerk and said I wanted to speak. The Chair allowed me to provide a couple of minutes of why CE would not make bad pharmacists any better, and then he moved to another bill. At that point, I vowed to learn more and advocate more for pharmacy in the future. I don’t think I envisioned becoming the registered lobbyist I am today. Again a long story, but back then we had no “Legislative Day”. We had no “Leg Day 101”. We didn’t have a lobbyist on contract let alone the two we have today. (I’m counting myself and Jim Owen, the guy that does the real work for us in Springfield!). ICHP has a strong Government Affairs Divisions led by Frank Kokaisl and members from all practice settings. We are in a much better position today with both the General Assembly, the Department of Financial and Professional Regulation and the Board of Pharmacy than we have ever been. If a member wants to become politically active either as an advocate or a candidate, ICHP has the resources to provide training and guidance through the process. It would be fun to help a fellow pharmacist break back into the General Assembly! Finally, back in the late 1980s, I was invited to attend ICHP’s first Leadership Retreat. It took place at the Marriott Lincolnshire, not necessarily what I think of as a retreat center, but it brought together the Board of Directors and select past presidents to plan ICHP’s future. During that retreat and subsequent retreats, leadership training was incorporated into the agenda and many of my early lessons in leadership came from those retreats. Today, ICHP conducts our Leadership Retreat annually in November. It begins on a Friday at lunch and ends Saturday afternoon around 3:00 PM. We provide leadership training at every retreat. Last year, the book Decisive written by Chip and Dan Heath was reviewed. The book described how most individuals make decisions and how anyone can use the book’s principles to make better decisions in the future. We now invite the Board, past presidents, and our most active volunteers. 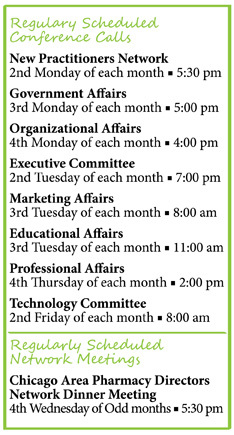 ICHP covers all the meeting costs including food and lodging. We no longer use properties like the Marriott Lincolnshire but focus more on rural retreat centers throughout the state. Is Using the Number of Patient Medications the Best Strategy for Identifying Patients at Risk for Hospital Re-admission Within 30 Days? Although previous studies have shown an association between the number of medications patients take and medication errors and discrepancies,1,2 a recent report from the University of Kansas Hospital (UKH) has attempted to determine the number of medications most beneficial in identifying patients with high rate of 30-day re-admissions.3 A common strategy is to use between 5 and 10 medications in identifying patients at risk for non-adherence with their medication regimen. Since a significant majority of hospitalized patients take 5 or more medications, hospitals may choose a higher cutoff of medications to avoid the significant workload this would pose with intervention strategies. Therefore, it is desirable to determine the number of medications sensitive enough to identify most patients at risk for non-adherence. In the UKH study, patients admitted to a 36-bed medical and surgical unit were flagged to receive counseling by a pharmacist if they had ten or more maintenance medications and as-needed narcotics or if they were on a ‘problem medication’ (e.g., anticoagulants, insulin, aspirin plus clopidogrel, digoxin, or narcotics). UKH was a participant in Project BOOST4 for this study and the ‘problem medications’ were ones identified by this initiative. The number of patients on 10 or more medications without a problem medication was not reported. However, more than 70% of patients in the pharmacist intervention group met both criteria and therefore received counseling and assistance with their medications. Over the 4 month study period, 16.8% of 537 patients who received pharmacist assistance were re-admitted within 30 days of discharge as compared to 26% of 192 patients who received usual care. What is particularly interesting is the reported correlation between the number of medications and the 30-day readmission rate. Both groups showed a consistent increase in readmissions; from 12.2% for patients on less than 10 medications to 36.4% for patients on more than 30 medications. Study limitations included low number of participants in the control group, lack of randomization and patient location limited to one patient care unit. Although this study shows a distinct correlation between the number of medications and risk for re-hospitalization, there are many other factors that influence medication adherence, such as health literacy, regimen complexity, side effects, financial situation of the patient, and patient understanding.5 At least two reports provide a ‘medication complexity index’ calculation for patients taking antiretrovirals6 and another for patients with hypertension and/or diabetes.7 So is the number of patient's medications the most efficient strategy for identifying those who are non-adherent and therefore at greater risk for hospital readmission within 30 days after discharge? How often are you unable to obtain your medications? How often do you miss taking your medications? How often are you unable to obtain medications? How often do you miss taking your medication? Although response accuracy was not confirmed, the 35% of patients recorded as missing some medication doses rarely, occasionally, or frequently is within the range of medication non-adherence reported in the literature.8 With respect to potential workload of providing additional medication assistance, the number of patients identified by asking these two questions is well below the 73.7% of patients in the UKH study. Unfortunately, an analysis of the effect on 30-day re-admissions using this screening tool was not done and would be difficult to assess since medication adherence is only one part of the admission evaluation. In conclusion, based on the literature, it appears that providing hospitalized patient counseling and intervention based on the number of medications that a patient takes and the use of problem medications can reduce 30-day hospital re-admissions. However, this measure may not be sensitive enough to make efficient use of the healthcare provider’s time. Asking patients if they are non-adherent may help refine identification of people with the greatest need for assistance, although further study of this screening tool is needed. Makaryus AN, Friedman ED. Patients understanding of their treatment plans and diagnosis at discharge. Mayo Clin Proc. 2005;80:991-4. Forster AJ, Murff HJ, Peterson JF, Gandhi TK, Bates DW. The incidence and severity of adverse events affecting patients after discharge from the hospital. Ann Intern Med 2003;138:161-7. Pal A, Babbott S, Wilkinson ST. Can the targeted use of a discharge pharmacist significantly decrease 30-day readmissions? Hosp Pharm 2013; 48:380-8. Society of Hospital Medicine. Project better outcomes for older adults through safe transitions. https://www.hospitalmedicine.org/ResourceRoomRedesign/RR_CareTransitions/CT_Home.cfm July 2011. Ingersoll KS, Cohen J. The impact of medication regimen factors on adherence to chronic treatment: a review of literature. J Behav Med 2008;31:213-224. Martin S, Wolters PL, Calabrese SK, Toledo-Tamula MA, Wood LV, Roby G, Elliott-DeSorbo DK. The antiretroviral regimen complexity index. A novel method of quantifying regimen complexity. J Acquir Immune Defic Syndr 2007;45:535-544.Jencks SF, Williams MV, Coleman EA. Rehospitalizations among patients in Medicare fee-for-service program. N Engl J Med. 2009; 360:1418-28. Rettig SM, Wood Y, Hirsch JD. Medication regimen complexity in patients with uncontrolled hypertension and/or diabetes. J Am Pharm Assoc 2013;53:427-31. Fischer Ma, Stedman MR, Lii J, Vogeli C, Shrank WH, Brookhart MA, Weissman JS. Primary medication non-adherence: Analysis of 195,930 electronic prescriptions. J Gen Intern Med 2010; 25:284-90. I was born and raised in Chicago and attended Harold Washington College where I received my Associate in Science in 2009. Trace your work history: where have you trained / worked/ any special accomplishments? I have worked in the pharmacy department at Northwestern Memorial Hospital since 1995. I started in the pharmacy billing department and was later asked to work as a pharmacy technician. I accepted and I am glad I did. During this time, I worked in many areas such as investigational pharmacy where I worked closely with research studies. I’ve worked in both inpatient and outpatient oncology where I learned how to prepare 24 hour chemotherapy batches including infusions, intrathecal, IM, topical, and oral compound cytotoxic agents. I also worked in the neonatal pharmacy where I learned to dilute intravenous solutions for neonatal and pediatric patient populations. I worked with ADC’s (Omnicell). I have been able to work and learn every area here in the pharmacy department at Northwestern which has helped with my current position as a practice coordinator. I was given the opportunity to take on the role of Practice Coordinator. Being the first pharmacy technician to take on this important role here at Northwestern, I feel that it is my duty to elevate the role of pharmacy technicians to the highest level possible. Being able to be part of pharmacy and its evolvement here at Northwestern has been an amazing experience. I work closely with pharmacists and technicians to improve or maintain workflow in each area. We have been working together and succeeding at getting many technicians certified and more involved in projects. I work closely alongside four other Practice Coordinators who are pharmacists. I was able to be part of Tech Check Tech, which we rolled out in September of 2013. Learning that there were associations that pharmacy technicians can be part of, I wanted to jump at this opportunity to be able to learn as much as possible from others and bring back that knowledge to Northwestern. Being part of ICHP gives me the opportunity to meet other people with the same interests as me and to discuss ideas and ways to improve pharmacy as a whole. Become involved as soon as possible and take advantage of all the opportunity and guidance that ICHP has to offer! What is your vision for pharmacy in the future? Or what would you like to see accomplished within pharmacy? I would love to see more technicians work with pharmacists and be directly involved with patient care in both the inpatient and outpatient settings. Do you have any special interests or hobbies outside of pharmacy/work/school? I started running back in 2011 to stay healthy and I have become addicted. I have run 6 half marathons and ran my first full marathon last year and will be running my second this year. I never thought I would be able to run more than a block but with training, it became possible. I guess a unique fact about me that not many people know is that I used to be a Latin dance instructor. I stopped teaching back in 2001. The May 13th Board of Pharmacy Meeting was held at the James R. Thompson Center in Chicago. These are the highlights of that meeting. Pharmacy Practice Act Rules – The new draft rules for the Pharmacy Practice Act are expected to be published in the Illinois Register on Friday May 16th. This will initiate a 45-day public comment period. ICHP and other pharmacy organizations have been involved in the development of these rules, so we are not anticipating any significant issues with them. ICHP will provide written comments to the Department before the 45-day comment period ends. Controlled Substance Act Rules – A proposed draft of the Illinois Controlled Substance Act Rules was published in the March 7th Illinois Register. The 45-day comment period ended on April 20th, and ICHP provided comments related to those proposed changes. The Department received a variety of comments and is in the process of evaluating them all and incorporating those that are considered appropriate. A final draft is expected to be sent to the Joint Committee on Administrative Rules within the next 30 days. Federal Compounding Regulation – Department staff attended a conference that discussed the regulation of outsourcing facilities hosted by the FDA in April. The conference did not provide much guidance for states that wish to establish their own regulations. However, the IDFPR staff did indicate that facilities that consider themselves “outsourcing facilities” should obtain a Wholesale Distributor license in Illinois if they provide product to pharmacies within the State. At this time, the Department has determined that any compounding provided to a physician office or clinic must be patient specific with a prescription or be compounded in anticipation of a patient specific prescription. This continues to pose a serious issue for physician offices and clinics that use products that are compounded in multidose containers whether sterile or non-sterile. Illinois Legislative Update – Garth Reynolds, IPhA Executive Director, provided this meeting’s legislative update. Mr. Reynolds highlighted many of the bills ICHP is currently monitoring, and those may be found in this issue’s GAS From Springfield column. Visitor Question and Comment Section – The Board entertained questions and comments from the visitors present at the meeting. One visitor raised a concern with a proposed Chapter 800 by USP. The Chapter is being written to provide standards for handling hazardous materials. The first draft appears to have substantial requirements for the safe handling of hazardous drugs that would create a prohibitive environment for dispensing medications such as methotrexate, progesterone or any oral or injectable chemotherapy agents. Board members recommended working with national pharmacy organizations to address these concerns. Next Board of Pharmacy Meeting – Is scheduled for Tuesday, July 8th at 10:30 AM on the 9th floor of the James R. Thompson Center in downtown Chicago. Pharmacists, pharmacy students and pharmacy technicians are welcome to attend the open portion of the meeting. 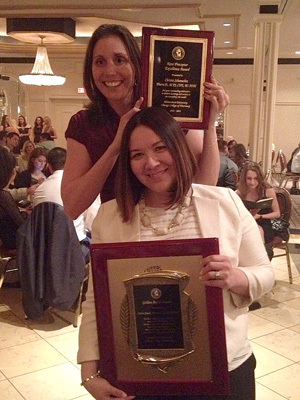 Congratulations to these ICHP members on winning awards at Midwestern University Chicago College of Pharmacy! Kathy Komperda received the Preceptor of the Year Award. Carrie Sincak received the Golden Apple Award. Christie Schumacher received the New Preceptor Excellence Award. 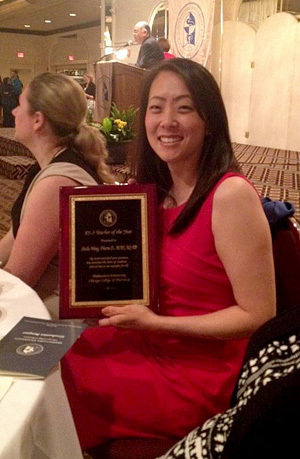 Sheila Wang received the PS3 Teacher of the Year Award. 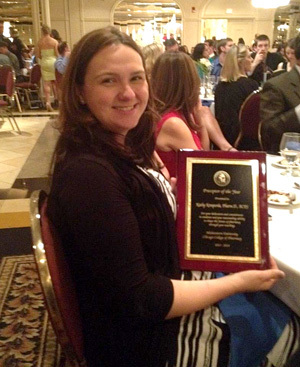 Sarah Wieczorkiewicz was named Alumnus of the Year. Have you or your colleagues won any awards? Brag to us! - email AmandaW@ichpnet.org. For the General Assembly It’s May Madness! The month of May brings a flurry of activity and a rush to the finish-line for the Illinois General Assembly. Finishing all their business by midnight on May 31st is always their ultimate goal, even if they accomplish little when they get there. You see, if they do not finish their work at that time, the General Assembly goes into “overtime”, just like the Blackhawks have done so many times this year, and just like in hockey, the rules change dramatically! In hockey, the overtime is sudden death. In the General Assembly, the end is not as fast and easy as the first goal scored, but rather the simple majority required to pass legislation becomes a super majority of 60% of those voting. There is no overtime pay or playoff bonuses, simply per diems to help with travel and housing, and it is much tougher to get things done. So as May winds down, we have been watching several bills and lobbying on your behalf on a few others. We hope that we don’t see movement on the biosimilar bill, and the sponsor continues to promise that is the case. We have worked to find a compromise on SB2941, which would have hidden Class 3 and 4 felony convictions for possession of marijuana with intent to distribute from any potential background checks, and finally, we are still waiting to see language that will raise pharmacy-related licensing fees in the future. We encourage you to review the current bill list provided below and take any opportunity to speak with your legislators about any of these issues between now and the end of the month. We’ll let you know in next month’s edition what we need you to communicate to your legislators during the summer, when they are out locally in full force raising campaign funds, marching in parades, kissing babies and doing what they can to impress the voters. As we mentioned above, anytime is a great time to meet with your legislators when they are home on the weekends or after this year’s spring session has ended. Many fundraising events are already occurring across Illinois and many are not the $1,000 a plate, high profile dinners we hear about in the news. Many events ask for contributions of $40 to $60 per person to meet and greet the candidates, grab a beverage and a bite to eat and maybe run into some friends or health care colleagues. You know your physician and nurse practitioner friends really understand how to play the game…isn’t it time you learned? And if, in your opinion (and we sincerely value that), the candidates in your district aren’t worth supporting, then send some campaign contributions to the ICHP Pharmacy Action Fund to support ones that are! You can’t win if you don’t play! And Pharmacy can’t win in Springfield unless we all roll up our sleeves and make good contributions on its behalf also! To order your tickets, go online to obtain an order form that may be mailed or faxed at 815-227-9294, or call the ICHP office at 815-227-9292 with a credit card. Please do not email order forms to the office. Credit card information in scanned and emailed format is not safe. Here are the bills we have been watching for you and their status at the time this edition was written. Some of them are nearly dead, but again, we are never sure until the General Assembly adjourns. If you have questions about these or any other bills, please contact us via email (jownenconsulting@aol.com or scottm@ichpnet.org), and we will do our best to help you better understand and advocate for pharmacy. On April 13, 2014, members of the Illinois Council of Health-System Pharmacists (ICHP) New Practitioners Network (NPN) and student society members had the opportunity to cook and serve brunch for the families at the Ronald McDonald House, an event organized by Dr. Colleen Czerniak for a second straight year. A group of 15 pharmacists and students cooked and served up a delicious brunch that served approximately 50 guests of the house. From pancakes to endless egg casseroles, bacon and sausage, there was a spread of food that was made from the hearts of ICHP members. As a pharmacy student, I felt volunteering at the Ronald McDonald House was a great opportunity to give back to the community, while meeting pharmacy students from Chicago State, Midwestern, and Roosevelt as well as pharmacists from all over the Chicago area. There’s no better way to get to know colleagues on a more personal level than to cook a meal with them and share the joys of volunteerism. It was so rewarding to be able to talk with new practitioners, residents, and other pharmacy students in a setting that was away from academics. While serving food, I had the opportunity to talk to a guest whose 4-month-old great-grandson had a heart transplant the day before. He expressed his gratitude to ICHP for making brunch and the Ronald McDonald House for providing such an amazing place to stay. He spoke about how the Ronald McDonald House is his “home away from home” while he helps care for his family. There were also children there that were patients receiving intense outpatient treatment, requiring them to be near the hospital for an extended period of time. Having the opportunity to speak to patients and families was a great reminder that each patient’s story is complex and that the families need support as well. As a pharmacist and NPN member, I really enjoyed the “Meals from the Heart” volunteer event because it offered a different perspective and ability to appreciate and assist with the needs of the families in addition to the patients we typically care for. It was fantastic to be able to talk with students and residents outside of the clinic or classroom and hear their thoughts and impressions about school, residency, interviews, etc. and offer any advice I could. It was also great to see students from different schools sharing their experiences with each other. 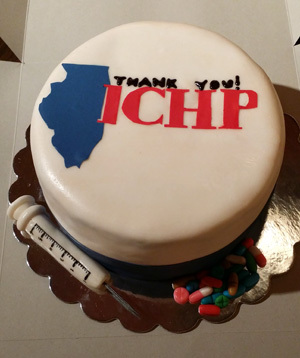 My involvement with ICHP and the NPN over the years has allowed me to become engaged in my profession and career and has provided an opportunity to meet many great pharmacists and students throughout Illinois. The Ronald McDonald House “Meals from the Heart” event was a perfect opportunity to meet and network with others while giving back to a very well-deserving community. Thank you to all of those who volunteered for the event and special thanks to Colleen Czerniak for organizing a wonderful day! 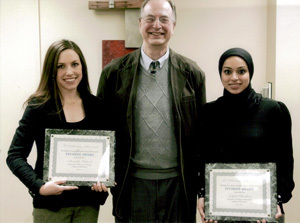 Roosevelt University College of Pharmacy’s (RUCOP) Student Society of Health-System Pharmacy focuses on enhancing student learning through several diverse and unique experiences. Our chapter was given a wonderful opportunity to attend the 8th annual Under the Dome: Pharmacy Legislative Day in Springfield, IL with APhA-ASP and ACCP student chapter members, faculty advisors, and pharmacists in the community. Legislative Day, or Leg Day as it is affectionately referred to, is a collaboration between ICHP and IPhA. Leg Day provides pharmacists and student pharmacists an opportunity to talk to state legislators face to face about current legislation that will affect the profession of pharmacy. We were honored to have the opportunity to not only attend and talk over the issues with our representatives, but to also see first hand how the political system and law making bodies can potentially enhance the future of pharmacy. The day started out very early in the morning. RUCOP students rode on a bus to Springfield alongside other pharmacy students from Rosalind Franklin, UIC and Midwestern University, as well as faculty advisors and pharmacists. This bus ride enabled us to discuss the three bills that were currently on the docket that would affect the profession of pharmacy. These bills included: SB1934 - which addresses the interchangeability of biosimilar drugs, SB3277- which would enable pharmacists to help in vaccinating children against meningococcal disease, and HB4230/SB2674 - which addresses stable funding for the Illinois Poison Control Center. When all the students came together in Springfield at the Hoogland Center for the Arts, we participated in a CPE Legislative Orientation presented by Mr. Scott Meyers, Executive Vice President of Illinois Council of Health-System Pharmacists, and colleagues. This session gave us further information on the lawmaking processes and specific talking points regarding the three bills. After the orientation, we were separated into groups based on voting districts, and each group was able to enter the capitol building for floor tours of the House and Senate as well as legislator meetings. Our group had the pleasure of meeting with Carol Sente, a representative from Buffalo Grove, and had the opportunity to answer some of her questions regarding the funding for the Illinois Poison Control Center. At the end of our conversation, it was amazing to hear that we had enhanced her understanding about the issue from a viewpoint she had never considered, and that we may have helped her to reach a decision on how she would vote. If, for any reason, a legislator was not in their office, we left behind some information regarding our thoughts on the particular bill as well as an invitation to the reception later that evening that was held in their honor. The evening reception gave us the opportunity to speak with representatives that we may have missed talking to earlier, in a much more relaxed and informal environment, as well as opportunities for networking with other pharmacists, student pharmacists, and others dedicated to the profession of pharmacy. After a very exhausting and exhilarating day at the Capitol, our chapter would jump at the opportunity to attend Legislative Day again next year. Personally, I am not a very politically-oriented person, and was a bit intimidated about participating; however I am pleased with my experience. Attending Legislative Day taught me much about what goes into passing healthcare-related laws that affect the profession of pharmacy. Now that I know more about Legislative Day and the impact that we, as professionals, can have on the law making bodies in our community, I would definitely attend Legislative Day in the future and would educate myself more regarding the current topics in legislation prior to attending. For anyone planning to attend next year, I would give just this advice: know the current political issues facing pharmacists and research them thoroughly prior to attending. As Pharmacy students and SSHP members, we now know that reaching out to the legislators to educate them and answer questions regarding bills will affect not only pharmacy, but healthcare as a whole. As a second year pharmacy student, I can say that my daily life consists of all things pharmacy: attending lectures, studying for exams, and participating in healthcare volunteer services. When ICHP members of the Midwestern University Chicago College of Pharmacy received an invitation from ICHP member, Dr. Colleen Czerniak about an opportunity to serve patients in a different aspect, though not knowing what to expect, we were thrilled to jump aboard. Student pharmacists from various ICHP chapters, along with practicing pharmacists, participated in the Meals from the Heart program by visiting the Ronald McDonald House in Chicago, Illinois. The House aims to serve families of children with complex medical needs who require long-term hospitalization. In order to help family members in their time of greatest need for emotional and possibly financial support, the Ronald McDonald House provides a “home away from home.” The Meals from the Heart program helps these families receive home-cooked meals prepared by volunteers from the Chicagoland community each day. 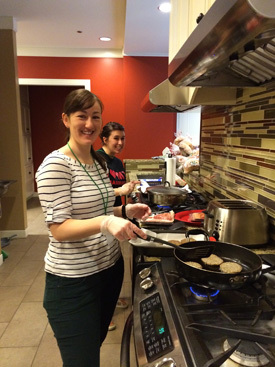 ICHP members were assigned to make breakfast for the families currently residing in the Ronald McDonald House. In order to provide the families with a wide array of food, each individual was responsible for bringing a specific breakfast item to cook. Upon arriving at the Ronald McDonald House, we were introduced to the friendly staff as well as the impressive kitchen. Members helped one another make stacks of pancakes, scramble dozens of eggs, and fry bacon, among an eclectic collection of breakfast food. During breakfast time, volunteers helped serve the prepared food to the family members. After cleaning the used kitchenware, we were given a tour of the Ronald McDonald House. Located in the heart of Chicago, the House delivered a remarkable view of the city. There were many rooms catered to all family members: a meditation room stocked with religious books for those who wish to have peace of mind, countless colorful play rooms to entertain the children and their siblings, and even a gift room stocked with donated, new toys that the children could choose from and keep. I was very grateful to partake in this volunteering opportunity alongside pharmacy students and pharmacists. This experience served as a reminder to have a thankful attitude for my circumstances and not to take many aspects of my life for granted, like time, relationships, and especially health. 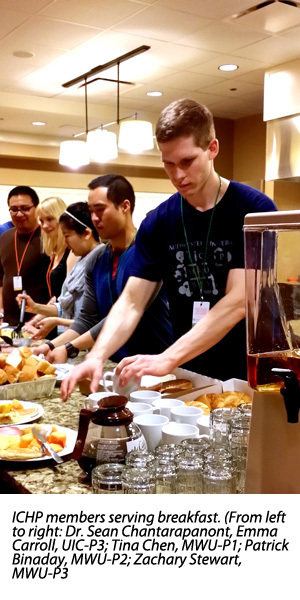 Preparing and serving breakfast with fellow ICHP members helped remind me of these lessons that cannot always be taught in the classroom setting. I hope to integrate what I have learned into the remainder of my pharmacy school career and to one day compassionately serve patients as a healthcare professional. Names below reflect donations between June 1, 2013 and June 1, 2014. Giving categories reflect each person's cumulative donations since inception. Click here to make a donation to the PAC.